The Y adapter for Illumina sequencing with a custom barcode (violet). Around 2007, the advent of next generation sequencing opened a new approach to biology. These sequencing techniques, such as 454 and Illumina, are able to produce vast amounts of sequence for a relatively low cost. The sheer volume of DNA data produced by this method can be intimidating. However, this does not need to be the case. A little bit of knowledge of the relevant computer programs and techniques can carry us a long way. This page links to a number of our tutorial videos on simple methods for next-generation sequence analysis. If you are interested in practical tools for your sequencing program visit our methods page. These videos are aimed primarily at biologists who previously lacked the bioinformatics knowledge to analyze and manipulate these large data sets. Direct funding for this these videos was provided by the UC Davis Genome Center. The research experience on which these videos are based is funded by the National Science Foundation Plant Genome grants DBI-0733857 (Functional Genomics of Polyploids) and DBI-0822383 ("TILLING by Sequencing"), and National Institutes of Health R01 GM076103-01A1 (Dosage dependent regulation in hybridization) to LC. This series of videos looks at using the Terminal program (which comes on every Macintosh computer) to view and parse large sequence datasets. NOTE FOR PC USERS: All Macs are Unix-based machines and the Terminal is simply a command line prompt that allows the user to work in Unix. There is no default equivalent found within Windows. However, it is possible to install a Unix environment on a Windows machine. In this case, these videos will still be of assistance, but some minor details (such as the display of outputs) will differ from what you will see here. For instructions on installing a Unix environment in Windows see this article. Video 1 - Using the Terminal: "grep" and "less"
This video will introduce the Terminal program and discuss two basic commands. The first is "less" which is used to display data, the second is "grep" which is used to search or count within the data. This video briefly discusses the biological background of the experimental data set used in the next two videos. This video takes a look at the data from an actual experiment where an Illumina sequencing run was aligned to a cDNA database. Here the user will learn how to navigate through the output and how to parse the data file using the "grep" command. This video shows how to perform a basic data analysis on the same dataset as above. Here we undertake an "in-silico Northern" analysis and look at gene expression differences for a target gene as well as a housekeeping gene. In this new series, we'll learn how to access and analyze public datasets resulting from next-generation sequencing techniques such as Illumina and 454. We use Galaxy for many of these analyses. This video shows how to find a sample dataset, upload it to Galaxy, and process it for alignment. This video shows how to upload a cDNA database to Galaxy and how to perform a BWA alignment with our sample rice sequence. In this video we briefly examine our BWA alignment in Galaxy and convert the file to a format required by the genome browser "IGV"
In this video we use the files created in video #4 as an introduction to using the Integrative Genomics Viewer (IGV). We examine read coverage and visualizing a SNP. Here we go through an entire workflow on Galaxy, starting with two RNA-seq datasets. These datasets are aligned to genomic DNA using TopHat and then further processed and analyzed using Cufflinks/Cuffcompare/Cuffdiff, resulting in a comparison of transcript expression between the two datasets. This video uses IGV to examine the RNA-seq alignments to genomic DNA that were performed in video 6. 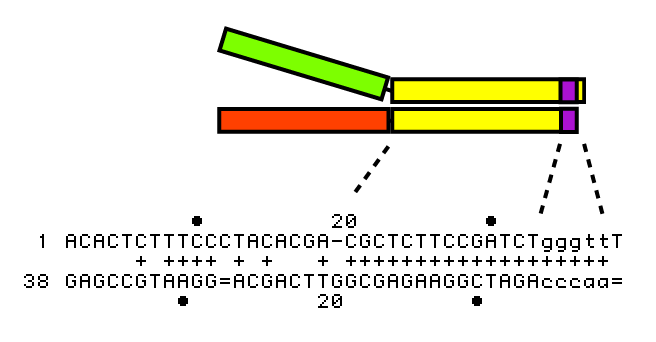 We also take a look at alternative splicing. This video provides a brief and simple introduction to multiplexing ("barcoding") for Illumina sequencing. Here we go through the principles and pitfalls of barcode design and link to some sample barcodes and our barcode generator. This video is a quick tutorial on how to download and use our barcode generator. This video demonstrates how to use TextEdit to edit the barcode generator if needed. Here we show how to download, install, and run the a5 Assembly Pipeline. In this trilogy of videos we introduce the potential problem of oveamplification in next-gen sequencing data. We then have a detailed walkthrough of a simple python script that detects overamplification in a FASTQ file, following by a demonstration of the script in action. National Institutes of Health R01 GM076103-01A1 (Dosage dependent regulation in hybridization) to LC. This page was last modified on 19 March 2014, at 11:51. This page has been accessed 61,113 times.